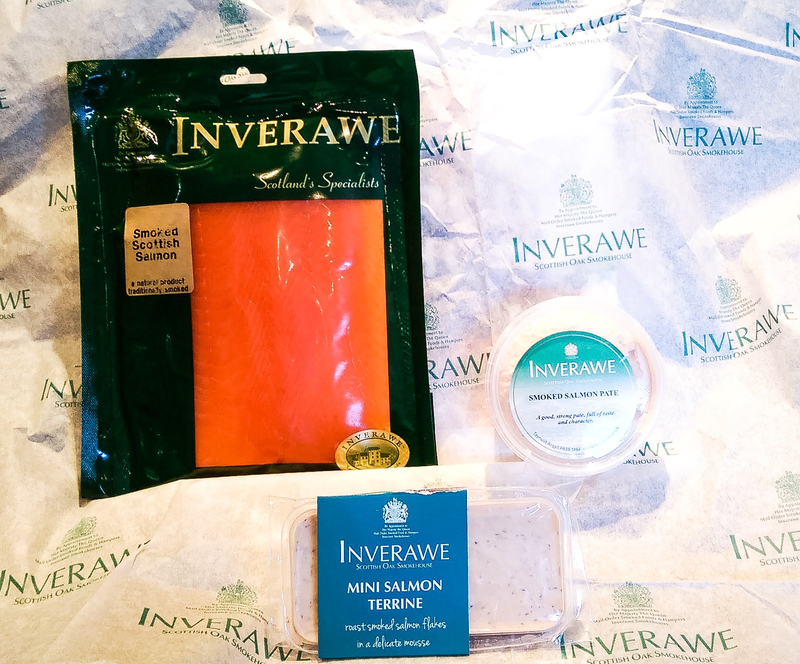 Inverawe Smokehouse are one of Scotlands smoked food specialists, consistently producing the some of the best smoked salmon that you will taste. For over 40 years, Inverawe Smokehouse has supplied quality smoked fish direct to both the public and restaurant trade from their base in the highland town of Taynuilt. All off the salmon used comes from farms that are committed to sustainable production. 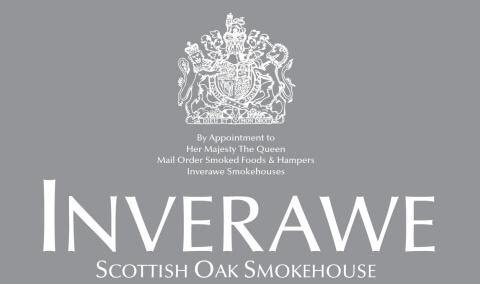 Once the have the fish prepared and ready to smoke, Inverawe Smokehouse still use a time honoured traditional slow smoking method which allows the fish to gently take up the gorgeous smoky aroma in its own unhurried time, giving the most delicious full-bodied oak smoked flavour that is distinctive to Inverawe. I was recently sent some of Inverawe a package including a mini salmon terrine, a deliciously cream smoked salmon pâté as well as a 200g pack of their wonderful smoked salmon. I could quite happily eat smoked salmon alongside a glass of ice cold fizz (to a band playing) but I had been asked to come up with a recipe that could showcase the rich smoky fish. 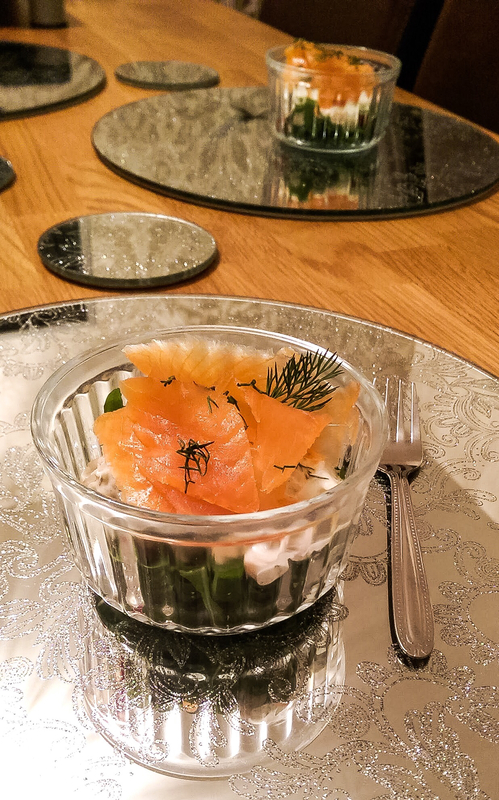 Smoked salmon is a popular addition to the Christmas table so I decided to create a simple remoulade of smoked salmon and celeriac that will knock the spots off of the common prawn cocktail starter. Finely chop half of the smoked salmon and set the other half aside for later. 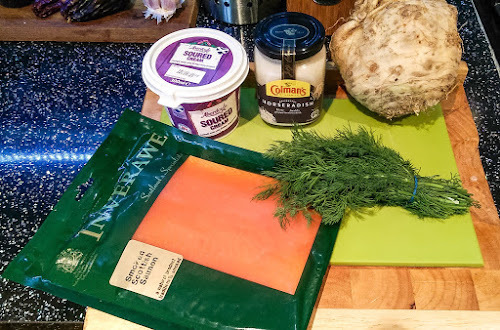 Add the grated celeriac, chopped salmon, dill, horseradish, soured cream and chopped dill into a bowl and stir until the celeriac is coated in the creamy sauce. Cover the bowl and put in the fridge until needed. This can prepared up to 24 hours in advance. Remove from the fridge about 15 minutes before serving. Divide the rocket and quartered tomatoes into serving bowls, (I used glass ramekins) and top with the smoked salmon and celeriac remoulade mixture. Layer the remaining smoked salmon slices over the top of the remoulade and garnish with a sprig of fresh dill. Inverawe's smoked salmon has strong smoky flavour thanks to the oak chips used in the smoking process and is balanced by the acidity from the horseradish and soured cream sauce. The subtle celery flavour from the grated celeriac and the anise flavours from the dill are a perfect balance to the rich smoked salmon. This dish would make a fantastic starter for the Christmas dinner table and with 10% off the price of Inverawe Smoke Salmon until the 15th December, why not stock up? Order online at www.smokedsalmon.co.uk and enter the code FCAB001 at the checkout. I've eaten a lot of smoked salmon over the years and have to say that Inverawe Smoked Salmon is one of my favourites so far. If you like your smoked salmon to pack a huge hit of smoky flavour then Inverawe Smokehouse have the fish for you. Keep an eye on news or offers from Inverawe Smokehouse on Facebook and Twitter.